If you have been trying to grow your hair out with little or no luck, you could be experiencing a vitamin deficiency of some sort. Vitamins are essential to healthy hair and sustained growth. They can relieve dryness, thicken your hair shaft, eliminate split ends, stop breakage and prevent premature balding and graying. Vitamin supplements or foods enriched with vitamin A and C, biotin and niacin can help to transform dull, stressed and weakened hair into shiny, lustrous, glossy and faster-growing locks. 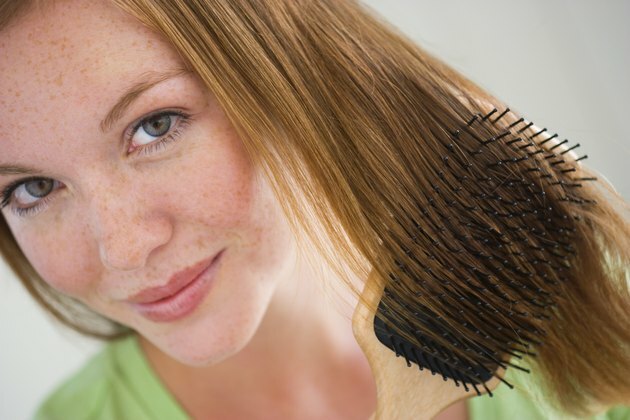 Vitamin A is an important vitamin for hair growth. It’s a fat-soluble vitamin, which means it can be stored in the body and is found in foods such as egg yolks, liver, spinach, sweet potatoes and oysters. Vitamin A promotes healthy skin, nails and hair. It assists bone growth and helps the body process myelin, a protective sheath surrounding nerve fibers. When taking supplements, you can easily overdose, which ironically can cause hair loss and dryness of your scalp and skin. Overdose risks are minimal when eating vitamin A enriched foods. The body converts beta-carotene to Vitamin A, so eating foods such as carrots, apricots, pumpkins, mangos and red peppers can help to maintain vitamin A levels. Vitamin C assists in the production of collagen, a connective tissue responsible for keeping your body’s tissues and organs together. When deficient in vitamin C, your hair may feel weak. Breakage and split ends can also occur. Smokers, according to an article on the Stop Hair Loss Now website, can become deficient in vitamin C and need double the amount of non-smokers. A 2010 Mayo Clinic article highlighted the U.S. Food and Nutrition Board of the Institute of Medicine’s recommended daily intake. A daily intake of 90 milligrams of vitamin C for men over 18 was suggested, with 75mg for women, 85mg if pregnant and 120mg if breastfeeding. You should not exceed 2,000 milligrams per day. Red and green peppers, broccoli, citrus fruits, tomatoes and berries all are good sources of vitamin C.
Biotin, or vitamin B-7, is a B-complex vitamin useful in preventing hair loss and premature graying. Biotin encourages elasticity within the hair’s cortex, according to an article on the Nutro Vita website, while thickening cuticles to eliminate breakage. The article also reported that biotin deficiencies could lead to seborrhea dermatitis, making your scalp itchy, dry and flaky. Soybeans, bananas, nuts, watermelon, saltwater fish, meat and poultry are all rich in biotin. Niacin, or vitamin B-3, is a water-soluble vitamin known to dilate the blood vessels. When taking supplements, you may experience niacin “flush.” This is a result of your capillaries widening, allowing for better circulation of blood to nourish your scalp and hair follicles. Flushing in most cases is harmless. However, it may indicate toxicity, occurring when niacin levels are too high, a risk factor of supplements. An article published on Add Hair.com discussed the effect of niacin with hair growth, suggesting it not only stimulates hair growth, it minimizes the accumulation of cholesterol. When cholesterol builds up on the scalp, it is converted into enzyme 5 alpha reductase. An increase in this enzyme is, according to an Androgenetic Alopecia.com article, linked with balding in men and women. Shrimp, fish, lean red meat, dairy, beans, almonds, carrots and celery are all rich in niacin. Will Certain Vitamins Make Your Eyelashes Grow?